I'm diggin' the vibe of ESP's Vintage Plus series! 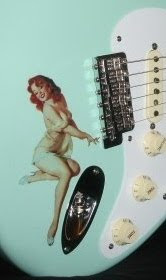 Paul Pesco uses a couple of these models on Live From Daryl's House. They seem to have a medium amount of relic wear on the body edges. A nice player's guitar with good ingredients, the Vintage Plus features Alder body, U neck, 22 XJ frets (extra jumbo? ), Gotoh Magnum Lock tuners, Wilkinson Vintage bridge and Duncan SSL-1 pickups. The 12th fret "ESP" rectangle inlay is on all models in the V-Plus series. Rosewood models are currently available in Burst or Oly White. Maple FB models come in Black or Candy Apple Red. The model above is a pre-owned listed by Bizarre Guitar of Reno . Also, Guitar Center online currently lists pre-owned models. Just enter ESP Vintage Plus into search below.